Stephen Curry is perhaps the greatest shooter in NBA history, but he has another underrated skill that makes him so difficult to guard. When Curry gives up the ball on offence, he’ll often keep running, and the Golden State Warriors will return the ball to him for an open three-pointer. The Warriors are hard enough to guard on their own, but when Curry is in motion, scrambling the defence, he makes life that much harder on opposing defences. The core of Stephen Curry’s greatness is his ability to shoot off the dribble from anywhere in the court. It’s common in the NBA today, but just years ago, defences weren’t prepared for the threat of Curry dribbling into a pull-up 28-foot three-pointer and making it. The threat of Curry’s shooting extended defences and spread the court like never before in the NBA. But Curry has another skill that few other players possess, and it’s one reason he’s such a wrecking force on offence. The Golden State Warriors love to scramble opposing defences, cutting, screening, and passing the ball until a hole opens up. It’s exhausting to cover, and few defences can ever defend it well enough over 48 minutes to win games. Curry loves to engage in this. What makes Curry so deadly is that when he’s hunting a shot, if one doesn’t open up immediately, he’ll give up the ball and continue running. It sounds like a simple enough task, but few players do it as well as Curry. Lots of ball-dominant players will give up the ball when they don’t have a shot and then stand at the three-point line, waiting for a kick-out pass or letting their teammates go to work. Not Curry. Curry loves to keep running after giving up the ball. Frequently, it will find its way back to Curry, and he is often open because his mere presence causes defences to freak out momentarily. This very skill is proving its worth in the NBA Finals. In the Warriors’ Game 2 win over the Cleveland Cavaliers on Sunday, Curry delivered some dagger three-pointers by remaining in motion until he got an open shot. He got a four-point play on almost the same setup – a switch, drive-and-kick, and run to the corner. 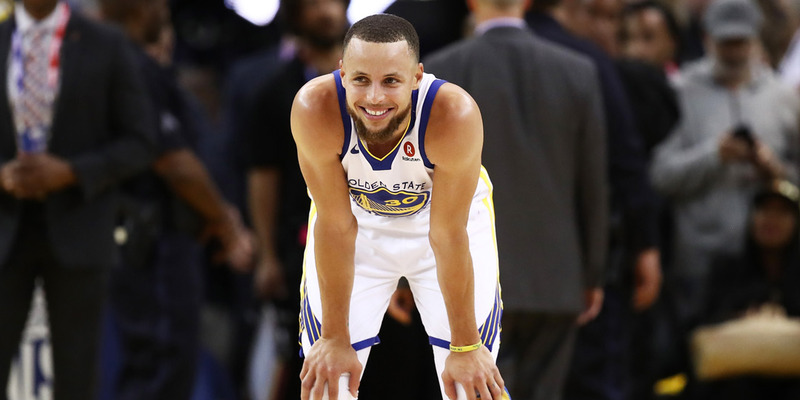 In Game 2, Curry set a Finals record with nine three-pointers, scoring 33 points on 11-of-26 shooting, with seven rebounds, and eight assists. This same action seemed to get Curry going in the Western Conference Finals against the Houston Rockets. Curry slumped early on in that series, and the Rockets’ switching defence clamped down on him while ignoring lesser threats on the floor like Kevon Looney or Jordan Bell. The Warriors answered with a brilliant adjustment: have Curry give up the ball to those non-offensive threats, then run to them to get a screen. For as airtight as the Rockets’ defence was in that series, players had trouble tracking Curry on those plays. Curry said the Warriors were at their best when they’re in constant motion. “How teams guard us with all our switching and things like that, you’ve got to find different ways to create space,” Curry said, via Anthony Slater of The Athletic. “Isos are great, and we have guys that are capable of doing that all across the board. Again, it’s not a skill for everyone. Running an offence is tiring. When LeBron James gives up the ball on a play, it’s not unusual to see him linger on the perimeter to conserve energy. Not all players can run an offence and then scramble around the court, trying to get open. The Warriors have an arsenal of weapons that make them an offensive juggernaut. Trying to track Curry, switch effectively, and not open up holes for other players is nearly an impossible mission.